As with any business or marketing tool, it’s worth thinking about what you’re trying to achieve by optimising your website for mobile use. When people use a mobile device to access your website, what is their likely goal? If people are trying to locate your shop or contact you, the website navigation should feature this option prominently. Alternatively, if users are likely to be trying to compare prices, post a review or make a purchase, your navigation should highlight those options. Information like your company profile might be best kept in the background unless it’s really important to your customers. People using mobile devices expect fast results. Websites need to load quickly to be effective on mobile devices. They also need to be easy to navigate with fingers, rather than a mouse or keyboard. The best mobile sites get people to the information or function they need within 1 or 2 clicks. They have buttons that are finger-sized and don’t require users to type, pull or zoom. Good mobile websites are more than just reformatted version of a traditional website. Think about your customers. If they are young or tech-savvy, and are regularly using mobile devices to access online information, you will need to carefully consider the functionality of your mobile website (as well as its look and feel). Consider specific features such as click-to-call (i.e. a button or image that a user can press to get an immediate connection with your business). Mobile device users tend to use social media and mobile apps that are more about connections, while a traditional website can get away with a one-way interaction. If you have developed a mobile app or a social media presence, you can link these with your mobile-friendly website to create a dynamic online experience for your customers. Mobile users like to share information with others. For example, they like to share links through social media, write online reviews or ‘check in’ to show their friends what they’ve been up to. 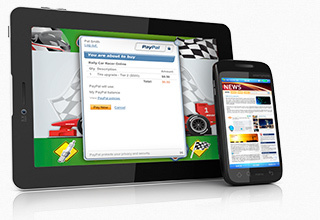 Consider incentives for people to use your mobile website or to engage with your business. Coupons, QR codes and special promotions can be effective marketing and engagement tools. Free website analytics tools can help analyse how well your website is working for mobile users. These tools can tell you how many hits on your website come from smartphones and tablets, and what is happening from there. If people are leaving your website immediately after they enter from a smartphone, your site may not be working effectively for mobile devices.